Northern Lights wedding fireworks packages usually start from £750 plus VAT, but can be as little as £600 for a unique and breathtaking fireworks display. Packages are inclusive of a site survey, set-up, de-rig, £5 million insurance cover and firework crew. Every Northern Lights fireworks display is tailored to meet your needs. Our design team will create a spectacular display to suit your budget, venue and incorporate your wedding colours. Whether booked at your request or by family and friends as a surprise Northern Lights will maintain a discreet presence until the moment arrives to fill the sky with light and sound spectacular. Northern Lights can provide 'quiet' displays if this is a requirement by the venue. Also available in fire writing are the Bride and Grooms initials either side of a love heart or a Champagne bottle that pours the ‘bubbly’ into a glass. Please contact us for further details. 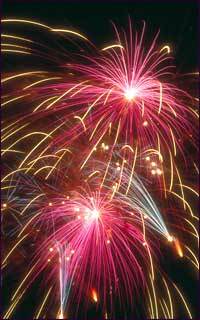 © 2006 Northern Lights Fireworks Company Ltd. (e) displays@nlfireworks.com (t) 01225 764 189.